After collecting samples of the poisons used on Sergei Skripal and his daughter Yulia, a team from the Organisation for the Prohibition of Chemical Weapons (OPCW) will conduct tests, with results expected to take at least a fortnight. 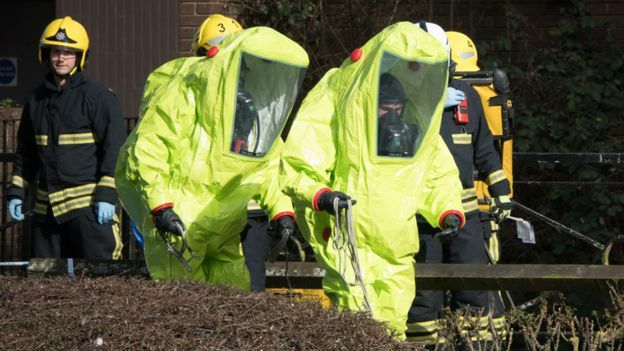 The UK government says the substance used was Novichok – a group of nerve agents it says is “stockpiled” by Russia, which is “culpable” for the attack. It has dismissed Russia’s claim that the poison came from the UK’s Porton Down facility. The work of the OPCW is carried out as part of an international control regime that governs what is, or is not, permissible as far as very toxic chemicals are concerned. 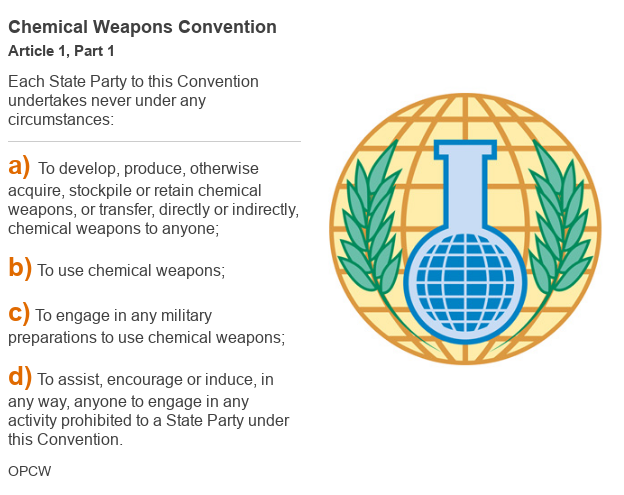 This was established by the 1997 Chemical Weapons Convention (CWC), to which 192 countries are signed up members. Only North Korea, Israel and Egypt have not ratified, but they are still bound by its provisions under international law. 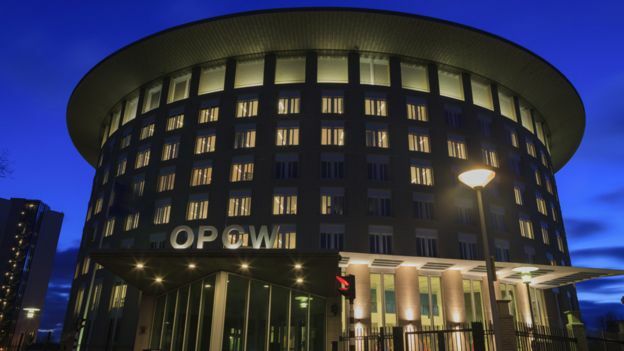 The CWC’s operational arm, the Hague-based inspectors of the OPCW, have overseen the destruction of nearly 97% of the world’s declared stockpiles of chemical weapons. Countries agree to never manufacture, stockpile or use chemical weapons – nor to assist others to do so. They are also required to declare what stocks of chemical weapons they have and where they could be produced. These declarations are used by OPCW inspectors to audit the destruction of chemical weapons and production facilities – a process that should happen within 10 years. Most countries meet this deadline, but Russia, which inherited the former Soviet Union stocks, and the US did not. The sheer size of their arsenals, the technical challenge of disarmament and costs have caused delays. Several months ago, Russia announced it had completed destruction of its nearly 40,000 tonnes of declared agents – the largest stockpile in the world. There is no dispute about this as the process was carried out under the watchful eyes of the OPCW’s inspectors. The US has destroyed some 90% of its declared stocks, with 2021-22 earmarked as the target date for completion. Its challenges have included persuading local communities that the work could be safely carried out in their neighbourhoods. But what about other chemicals and the Novichoks in particular? The Novichoks – those thought to have been used against the Skripals – were never declared to the OPCW, and the chemicals never formed part of any control regime partly because of uncertainty about their chemical structures. And specific names are crucial, because the CWC allows countries to legally possess a wide range of chemicals if they are identifiable. Under the convention, countries are allowed stocks of toxic chemicals and their precursors for peaceful purposes including industry, agriculture, research and medicine. 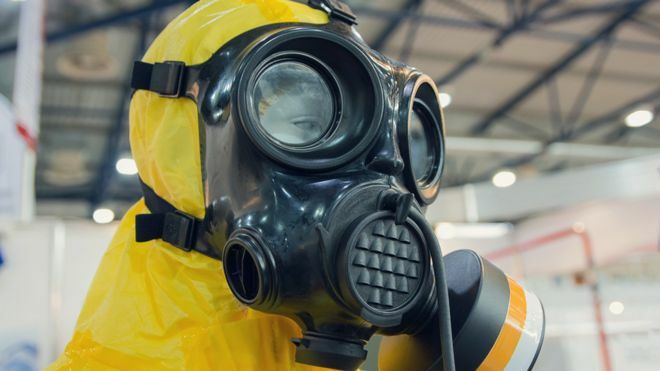 For recognised or potential chemical weapons, and chemicals that may be involved in their manufacture, only limited quantities can be kept. Signatories are allowed to hold a combined total of one tonne and one facility, usually a laboratory, where these substances can be made. These stocks can be used to develop protective clothing, gas masks, antidotes and for developing methods to identify chemical weapons. Auditing of these stocks by the OPCW is down to the milligram level. For other substances more widely used in industry, but which may be used to make chemical weapons, stocks are closely monitored. Complete records of the quantities manufactured, sold, used or disposed of must be kept by governments and the information passed to the OPCW every year. It audits these returns and carries out about 400 inspections of industrial premises globally every year. Where are the UK’s youngest and oldest city populations? Although the Novichoks fall outside these controls, and no country has declared possession to the OPCW, their existence became known in the 1990s. It is quite likely that some government laboratories made minute quantities. Their characteristics would have been stored in databases, so that their identity could be confirmed at a later stage if found as an unknown poison in someone’s blood. Whether this has happened in the UK’s chemical defence laboratory is not known. But it is important that the scientists working there were able to identify the Novichok nerve agent used to poison the Skripals as rapidly as they did. Identifying the agent is vital for the medical treatment the Skripals and Det Sgt Nick Bailey – the police officer injured in the attack – will be receiving.